GET INSTANT RESULTS WHEN YOU NEED THEM! Whether you're happily committed or single and ready to mingle, it's always a good idea to put your best face forward on Valentine's Day and what better way to start than with a flawless complexion? 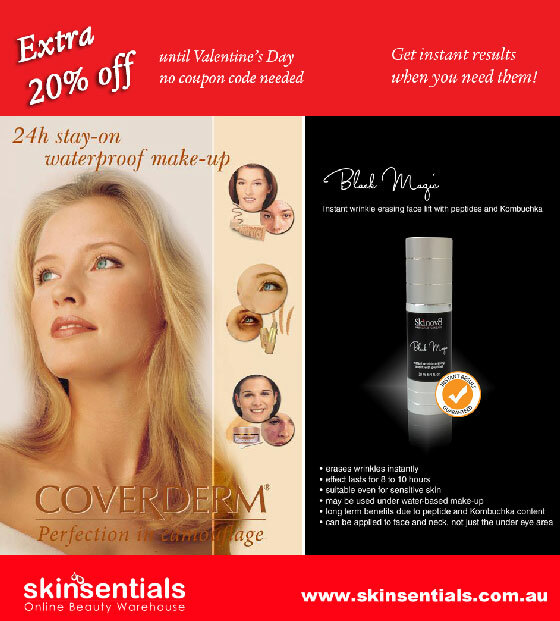 To make things easier, we are now giving you 20% OFF Skinov8 Black Magic Instant Wrinkle Eraser Facelift and all Coverderm products on top of our already discounted prices! The Black Magic wrinkle eraser will temporarily fix any wrinkle on the face and neck, as well as puffiness or bags under the eyes, while the Coverderm products, recommended throughout the years by dermatologists and make-up artists worldwide, will make that complexion look picture perfect.